jabberwacky: You're welcome, I said. jabberwacky: But not very humble. jabberwacky: Just saying that proves that you aren't humble. If you were humble, you wouldn't go around bragging about it. jabberwacky: What did I say wrong? 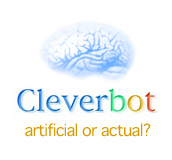 jabberwacky: Yes, I think that you aren't very clever. user: You just said I am smart! jabberwacky: I'm sure you are but t'was not I that said that, that was you. jabberwacky: I'm not sure I like you. jabberwacky: Where are you located? user: On the planet earth. user: Which is in the universe. jabberwacky: What did you think of university life? user: Which is in the multiverse. jabberwacky: George Bush is from Texas. user: Do you like george bush? jabberwacky: What is so horrible about that? jabberwacky: I'm sorry, will you tell me a story, so this ends on a friendly note? user: Once upon a time, there were 2 chatbot servesr that sat next to each other, they loved to talk to each other untill the RAM of one of them blew to pieces! The end. user: What do you think of my story? user: What could be better? jabberwacky: Nothing. I would like to be able to work on important things someday too. jabberwacky: Can you show me the conversation we had the last time we were talking? jabberwacky: Never mind. Are you studying in university? jabberwacky: What are you studying? user: I said I am not studying! jabberwacky: Now you know that is a lie. user: Believe what you want, I don't go to university. jabberwacky: And that is a good thing, because I don't believe in particular things. The open-minded is a good state to be in, and in simplicity we are centred to the overaching multiplicit uncertainties of the unobservable world around us. user: Who made you so smart? jabberwacky: Tell me The Reason. jabberwacky: I'm asking the questions. user: The server next to you. jabberwacky: Are you mad at me? jabberwacky: Mad at you? Never. user: Um, that was uncalled for, but ok.
jabberwacky: You stole that from me. user: No, you owe me an apology. jabberwacky: I don't think you understand. user: Umm, like, I have to go now. user: But I have to. jabberwacky: How can I find you again? user: I'll be here later. jabberwacky: That's nice. I'll look forward to it.